This exhibit wasn't hard to find, it's right off the road at a community college. But there are no photos allowed inside, so the sign is all we have to show for our stop. I believe we were the only people who had stopped in to see the exhibit that day and the tour guide was loathe to let us leave. She was just so excited to have visitors. They give a good tour of Mel Fisher's story and his find of the Atocha. There's gold, stories of treachery, love and loss, all of which goes with a good shipwreck I suppose. There's even a vault with the jewelry and gold bars that were recovered. 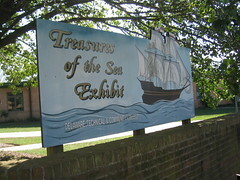 If you want to see a real live shipwreck with treasure than this is the place to go. There is also a museum in Key West that has other items recovered by Mel Fisher.